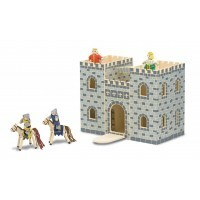 This wonderfully detailed Blue Knights Set is perfect for battles and will make a great addition to any youngsters wooden castle play set. The 4 piece blue knights set comprises of the Blue King on his horse and 2 of his most trusted foot soldiers. The Blue King has been at war with the Red King for over 20 years ever since the Red King defeated him in battle and stole his castle. Can the Blue Knights beat the Red Knights and reclaim their castle? Like all Papo figures the Blue Knights Set is made from durable PVC and the figures are precisely detailed and hand painted to ensure that they are as realistic as possible.